I’d hoped to play Advanced Song of Blades and Heroes last night at my local gaming club’s Monday night meeting. In preparation for the evening’s skirmishes, I prepared three warbands using Ganesha Games’ Warband Calculator, and assembled some new terrain from Dave Graffam Models. I made sure I had ready squads of cardstock minis from Okumarts, Paper Forge and Printable Heroes. I was ready to rumble. Unfortunately, real life cropped up at the last minute. I was late arriving for the game session, and didn’t have time to set up a table and recruit an opponent, so my ASoBaH ambitions were for naught. Still, I want to share the warbands I put together, in case you’re looking to get started with this great, elegant skirmish-level tabletop wargame. So in this post, I’ll share the warband lists, along with photos of the miniatures. Since I’m still new to the game, and I’m likely to be teaching the game to my opponent as we play, I deliberately kept the lists simple. A typical game of ASoBaH game is played with 400-point lists, but I limited these lists to 250 points, and kept the model Traits—special qualities that apply special rules to certain figures—to a minimum. I also wanted to use figures that are readily and inexpensively available, and that represent a variety of my favorite cardstock miniature artists. I created the lists using the official Advanced Song of Blades and Heroes Warband Calculator, on the Ganesha Games website. For convenience, I reformatted the figure data into two columns, so that each list would print as a single-page PDF. Apart from that, these downloadable lists are presented exactly as they appear when created in the Warband Calculator. The simplest list I put together was the band of goblin raiders that appeared in my first ASoBaH game, reported here a couple of weeks ago. The baseline Goblins have no Traits at all. The Goblin Bowmen have the Shortbow Trait (attack at range using the Medium range stick) and the Poison Trait (chance to erode the target unit’s Quality value on a hit). The Goblin Worgriders predictably possess the Long Move Trait (use Long range stick instead of Medium when moving) and Mounted Trait (+1 in Melee combat vs. non-mounted figures). The goblin figures are by Paper Forge, including #1 Goblin Warrior, #2 Goblin Archer, and #45 WorgRider. Paper Forge is a Patreon content creator, but they offer a free version of each of their minis that includes a single color variety of each, with front art on both sides. Minis with back art and reskinned versions in a variety of colors are available for a modest monthly patron fee. The ruined walls in the photo are a mixed set from Dave Graffam’s Crosspiece Ruins Set #1 and Set #2, and Archway Ruins Set. I revamped the Wood Elf warband from my previous game a bit for this outing. First, I removed the Forester Trait that I gave to all the elf figures last time—since there was no forest terrain on the board, Forester was a waste of points that disadvantaged the elf warband unfairly against the goblins. I also swapped out one of my Infantry figures for a Spearman, mostly because a single page of Okumart’s Wood Elves figures includes two armored elves with sword and shield, and two with spears. So the final Sylvan Patrol list includes a Captain with the Leader (improves Quality score of nearby models, and allows group activations) and Long Bow (ranged attack based on the Long range stick) Traits; two more Archers, with only the Long Bow Trait; two Infantry, with the Block (chance to reduce damage when hit) and Heavily-Armored (improved Combat score when determining damage) Traits; and a Spearman, with the Heavily-Armored and Long-Reach (may strike through allied figures in melee) Traits. The figures for the Sylvan Patrol are from Okumart’s Darkfast Classic Fantasy Set Two: Wood Elves; the set includes several more archers, a pair of elven sorcerers, and four elves mounted on stags, all of which would be easy to create in the ASoBaH Warband Calculator. The ruined walls in the photo are Dave Graffam’s crosspiece ruins, while the bushes are found in one of the Fat Dragon’s Castle Winterhawk sets, though I can’t recall which one at the moment. For my last list, I wanted to create a warband that included a rabble of low-quality soldiers supporting a single huge figure. I felt that the recent orc and ogre figures from Patreon provider Printable Heroes fit the bill nicely. The central figure in the warband is an Ogre, with the Big Trait (+1 Combat in melee vs. smaller figures, but +1 Combat for ranged attacks against the Big figure) and the Bludgeon Trait (50% chance to knock enemies Prone on any Recoil result). Leading the warband is an Orc Chieftain with the Discipline Master Trait (+2 on Activation rolls by nearby poor-quality allies). The front line of the orcish assault consists of three Orc Spearmen with the Dashing Trait (free attack action when first entering melee combat) and the Long Reach Trait. The orcish rabble consists of four poor-quality Orc Javeliners, who possess only the Javelin Trait (ranged attack using the Short measuring stick). Due largely to the poor quality of the Javeliners, this Orc Warband has even more members than the Goblin Raiders, above. The Orc and Ogre figures that make up the warband are from Printable Heroes on Patreon. Like Paper Forge, Printable Heroes offers free versions of all his minis with a single color scheme and mirrored front art on the back in most cases. Happily, the free version of the Ogre mini has full back art, and the file Onion_01.zip contains a green-skinned version of the Ogre with full back art! The ruins in the background of the photo are Dave Graffam’s Ruined Longhouse paper model. I plan to play Advanced Song of Blades and Heroes again soon, and give these new warbands a field test. I fear that the Orc Warband is going to be tough, at least until the Chieftain falls. Once he’s down, the Javeliners will probably crumple, but the Ogre will still be a threat. And the Sylvan Patrol will certainly be more formidable than last time out, now that they’re not wasting points on Forester in a fight outside of the woods. I’ll let you all know how it turns out. If you get a chance to play these ASoBaH with these warbands, or with your own armies, comment below to let us know about your battle! Until next time, keep printing, and keep playing! I’m so glad I’ve discovered your blog on Andrea Sfiligoi’s twitter feed! Keep this great content coming! Congrats! Thanks for the support! My goal is to post twice a week, Tuesdays and Fridays. I’ve missed one Tuesday so far, but I’ve managed to hit at least every Friday. I’m a big fan of Song of Blades and Heroes, so you can rest assured that more content on that game will be coming. I also have been meaning to check out several of Andrea’s other games, and I’ll report my experiences here as they happen. Try Four Against Darkness! It is awesome, although not a miniatures game. Really enjoying your blog! I’m slowly shifting away from plastic minis to paper ones for all of my games. Paper gives me so much more flexibility. Easier to carry and store. So many options – and if I need more I just print more! BTW – Who makes the trees in your Sylvan Elf Patrol picture? Glad you’re enjoying the blog, as well as the convenience and value of paper minis! Bad news about those trees, though. They were part of a digital sample offered to promote a Kickstarter for the TerraTiles system from Rainn Studios. TerraTiles are an impressive printed solution for tabletop gaming terrain, based around large hexes printed on commercial-grade boardgame board, accompanied by printed cardstock scatter terrain such as trees, boulders, fences and more. I searched a bit, but I can’t find a legit source for the sample PDF anymore. I’ve still got the file, but since Rainn isn’t offering it anymore, and their real business is physical products and not PDFs, I don’t feel like I can share it without violating their copyright. The bushes are still available, however. They are part of the Woodland Adventures set from Fat Dragon Games. The set is a bit spendy at its regular price of $16, though it includes a lot more than just some cross-piece bushes. 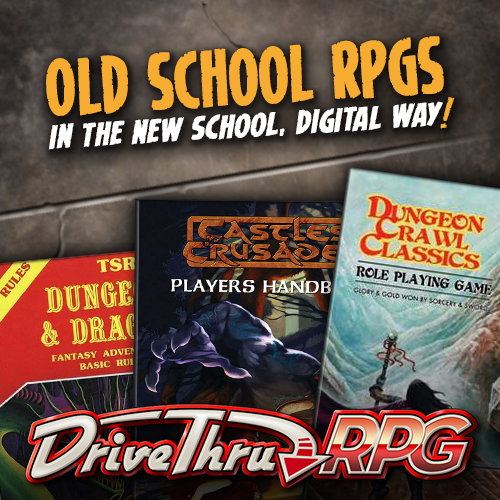 Fat Dragon does offer hugely discounted bundles through Drive-Thru RPG from time to time, though, and that’s when I usually expand my Fat Dragon terrain collection. One assembly note: instead of edging the bushes with a black marker, as I usually do, I used a green Sharpie, since the foliage goes right to the edge of the mini, with no black border. HA! I’ve got all of the Rainn digital terrain but totally forgot about them! Thanks. I’ll print out those trees tomorrow. Keep up the great blogging! That happens to me, too–I’ve got so much print-and-play material on my hard drive, I have forgotten at least half of it. When I realize I want to make more of something I’ve already assembled some of, especially scatter terrain like fences or bushes, it takes me half an hour just to find the right file. That’s pretty much a textbook example of a first-world problem, though, so I won’t complain. Are you using GIMP to fill the white space on the minis that you don’t cutout with black? You could do it that way, Doug, but it would be way more trouble than necessary. Actually, I just colored in the white space with the same black Sharpie I use to color the cut edges around the minis. That just takes a few seconds, and on the table, you’d never know the figuers weren’t printed that way. What Doug is asking about, folks, has to do with the fact that some printable miniatures are created with white space between their arms and legs. The artist expects you to trim out when you assemble the figures, presumably to make them look more “realistic.” For example, in the Okumarts Wood Elves set from which I drew my elven force, the archers and the captain all have white space between their legs. Rather than trimming that space out with my X-acto to separate their legs, though, I just blacked in the space with my Sharpie. I do this for two reasons. First, trimming that white space out is tedious and sometimes difficult to do accurately, and second, leaving solid cardstock between the legs makes the figure significantly stronger than it would be with two spindly little ankles. I’ve never once had another player complain because they couldn’t see between my elves’ legs. Incidentally, I also use that same Sharpie to black out the labels printed on my miniatures’ base tabs. Since I use the clear acrylic bases from Litko, you can see that writing through the base. I find that lettering very distracting, so I just color over it.